When you hold a Pueblo pot in your hands, you feel a tactile connection through the clay to the potter and to centuries of tradition. You will find no better guide to this feeling than Talking with the Clay. 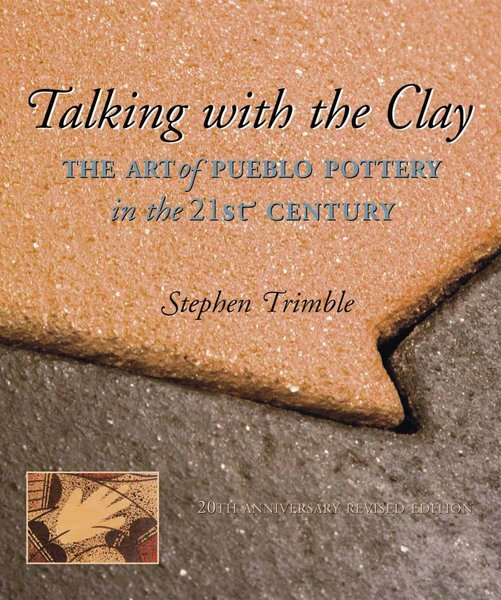 Stephen Trimble’s photographs capture the spirit of Pueblo pottery in its stunning variety, from the glittering micaceous jars of Taos Pueblo to the famous black ware of San Ildefonso Pueblo, from the bold black-on-white designs of Acoma Pueblo to the rich red and gold polychromes of the Hopi villages. His portraits of potters communicate the elegance and warmth of these artists, for this is the potters’ book. Revealed through dozens of conversations, their stories and dreams span seven generations and more than a century, revealing how potterymaking helps bridge the gap between worlds, between humans and clay, springing from old ways but embracing change. In this revised, expanded, and redesigned edition, Trimble brings his classic into the twenty-first century with interviews and photographs from a new generation of potters working to preserve the miraculous balance between tradition and innovation.